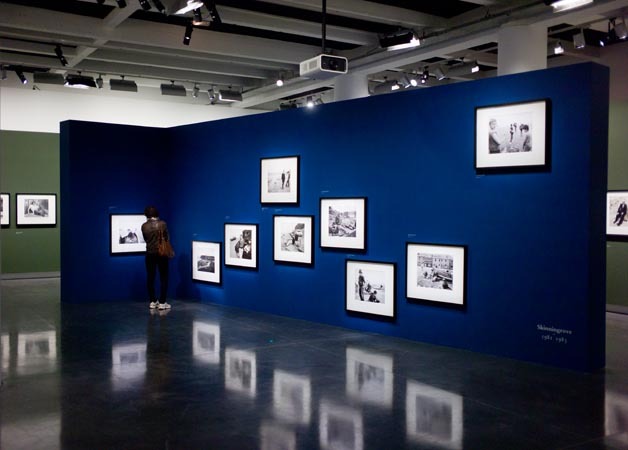 I was in Paris the last weekend and had the pleasure of going to see Chris Killip’s work at Le Bal in Paris. I throughly enjoyed seeing Killip’s work on the wall, it was great to see this work in person and not just in a book. It made me ask questions of his approach even more and gave me an even deeper appreciation of Killip’s work and what he achieved in the north of England during the mid 1970’s though the 1980’s. I made some images of the exhibition to give you all a feel of what was on display. I particularly liked this image as it shows what happened to just one street in a matter of a few years. It was a large enough show when we arrived I was a little shocked that the exhibition was only small, but I turned a corner found some stairs and realised that the exhibition space was over two floors and mach larger downstairs. 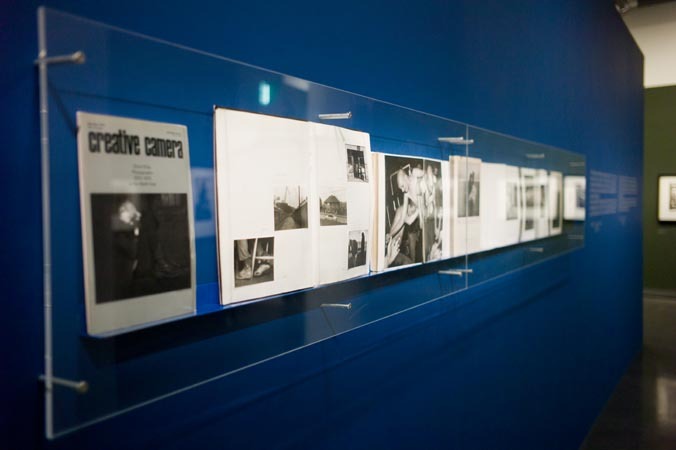 I liked that they also featured some of his books as part of the exhibition. If you every get the chance to see this work in person please do yourself a favour and go see this work. The images show a connection to people and place that is not condescending but somehow enables one to see the situation of poverty and displacement that was visited on the North of England under Thatcherism. This is what Le Bal have to say about Chris Killip. “The BAL inaugurates a British season with two exhibitions devoted to three major figures of british photography and cinema : Chris Killip in the Spring, Paul Graham in the Fall. One of the most important British photographers, from the early 1970s Chris Killip opened up new perspectives for documentary photography whose influence is perceptible in the work of others such as Martin Parr, Tom Wood and Paul Graham. Born in Douglas on the Isle of Man in 1946, Chris Killip took up full-time photography at 17 and was hired as assistant to a leading advertising photographer in London. 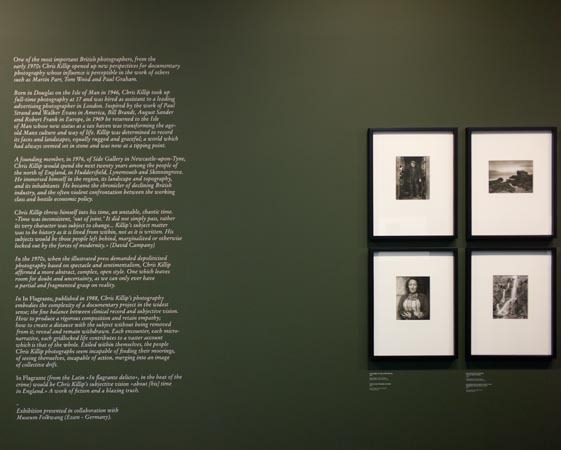 Inspired by the work of Paul Strand and Walker Evans in America, Bill Brandt, August Sander and Robert Franck in Europe, in 1969 he returned to the Isle of Man whose new status as a tax haven was transforming the age-old Manx culture and way of life. Killip was determined to record its faces and landscapes, equally rugged and graceful; a world which had always seemed set in stone and was now at a tipping point. A founding member, in 1976, of Side Gallery in Newcastle-upon-Tyne, Chris Killip would spend the next twenty years among the people of the north of England, in Huddersfield, Lynemouth and Skinningrove. He immersed himself in the region, its landscape and topography, and its inhabitants. He became the chronicler of declining British industry, and the often violent confrontation between the working class and hostile economic policy. Paul Graham will follow there in the Fall, I might just have to go back to Paris for the Paul Graham exhibition as well.